Webb Simpson has taken a further step towards securing top spot in the PGA Tour's money list by shooting a second round three-under-par 67 in the McGladrey Classic at Sea Island. The 26-year-old shares second place with fellow American Michael Thompson. Simpson fired 13 pars in his 67, which followed a first-round 63 to leave him on -10 overall. 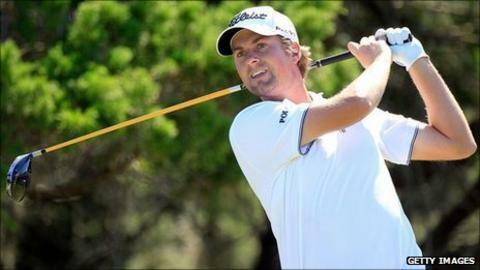 The American only needs to tie for 15th to move ahead of England's world number one Luke Donald in the money list. Another American, Billy Horschel, has a two-shot lead over the chasing pack on -12, with England's Brian Davis on -3 after a second round 69 and countryman Paul Casey on -1. Donald, who is not playing in the tournament, has entered the PGA Tour's final tournament next week at Disney's Magnolia and Palm courses in Lake Buena Vista, Florida, in a bid to end the year top of the money list. He is currently $68,971 (£43,617) ahead of Simpson and is trying to become the first player to win the money title on the PGA Tour and European Tour. It could be the first time since 2003 that the PGA Tour money title has gone down to the final tournament of the year. That was the same year as Donald's last appearance at Disney, when he missed the cut.